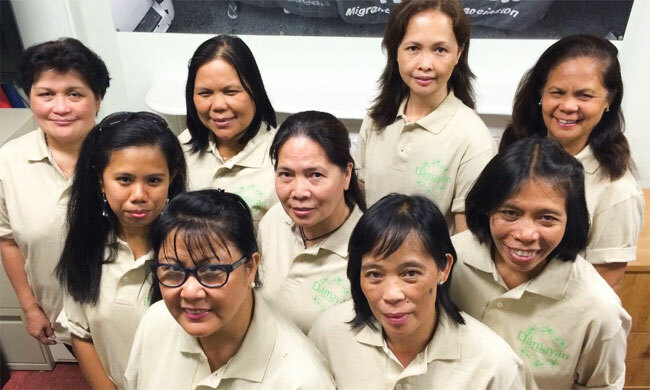 Judith Daluz (front row, right) poses with her fellows in the Damayan Cleaning Cooperative. Photo courtesy of Damayan Cleaning Cooperative. In 2013, Judith Daluz was a nanny making $650 a week, waiting for her four children to arrive from the Philippines. With her hard-earned savings, she had started paying $1,500 a month for a one-bedroom apartment in the New York borough of Queens that she hoped would be big enough for all of them. She hadn’t seen her children in years. In 2006, Daluz had been trafficked to the United States as a domestic worker. Now, as a free, documented worker, she was able to bring her children to live with her—but worried about how she would support them. Organizers at the Damayan Migrant Workers Association, a member-led organization helping Filipino workers understand and protect their rights, realized that many of its members had similar concerns. Established in 2002, the grassroots organization, led by Filipino survivors of human trafficking and other low-wage workers, has helped dozens escape abusive conditions, recover stolen wages, and pursue T visas, which allow trafficking survivors to remain in the United States. But many of Damayan’s members, once freed from forced labor, found themselves in another troubling, if less shocking situation: Even with better working conditions, they often had little job security and earned a pittance. With support from an organization participating in the city’s initiative, Damayan launched its worker-owned cooperative in September—a natural next step from their anti-trafficking and anti-exploitation work. Damayan’s members envisioned an enterprise that both protects their rights as workers and is guided not by profit but by their needs and those of the community. In 2006, Daluz left the Philippines to work as a housekeeper for a foreign diplomat living in an apartment on New York’s Upper West Side. Her employer promised her $1,800 a month—a salary that would help pay for one son’s college degree and another’s epilepsy medication. When she was about to depart, she learned he had decreased her pay to $500 a month. She boarded the plane anyway, thinking $500 was better than nothing at all. Once she arrived, she was forbidden to speak to anyone outside the diplomat’s family, forced to work seven days a week, 18 hours a day, and subjected to abuse by the diplomat’s daughter. She washed dishes, scrubbed the family’s sheets and clothes in the bathroom tub, cleaned all four bedrooms and every strip of the window blinds, and took care of the daughter. The family kept Daluz’s passport and threatened to deport her if she reported mistreatment. Even without the factor of diplomatic immunity, domestic workers are at risk for exploitation. Thanks to exemptions written into midcentury labor laws that some scholars believe were designed to exclude African Americans, domestic labor is one of the most poorly protected occupations in the United States. Household workers are still not offered the same federal protections as other workers for safety, medical leave, and sick days. In many states, home-care workers for the disabled and elderly were exempted from minimum wage and overtime laws until this year. Moreover, the nature of the work (including living with employers—often unofficially, behind closed doors, and with limited exposure to other people) makes workers susceptible to wage theft, abuse, and assault. Sixteen percent of the 377 labor trafficking cases reported this year by the National Human Trafficking Resource Center involved domestic workers. Labor exploitation boosts profits in economic sectors beyond domestic work. Other members of Damayan came to the United States through nonagricultural guest worker visas like H-2, a program the Southern Poverty Law Center calls a “modern day system of indentured servitude“; and J-1, a source of cheap labor for hotels, food chains, and amusement parks. Many sectors—from hospitality to agriculture—benefit from the labor of migrants who have few protections, even when not technically trafficked, according to Williams. “[They are] just as vulnerable, are just as much suffering,” she said. Daluz’s employers didn’t know that when Daluz took their daughter for play dates, she and other Filipina nannies talked in their native Tagalog about working conditions. The other workers urged her to leave, promising they would be able to help her find another job to support her family. In 2007, they helped her escape to Jamaica, Queens, where she lived for six years as an undocumented immigrant. Then in 2013, with the help of Damayan and a pro-bono lawyer, Daluz secured a T visa, granting her a path toward citizenship. The next year, Damayan, with support from the International Organization for Migration, helped Daluz bring her children over. Seven other Damayan families were reunited around the same time. It was a time of celebration that also brought new challenges: supporting the family and finding employment for spouses and children. Although Daluz was overjoyed to reunite with her children, the first year with them was not easy. Some of the children were homesick, and Daluz, a devout Catholic, was upset to find her kids had begun practicing non-Catholic Christianity. Furthermore, they still struggled economically: Though her oldest son has a nursing degree, he was first stuck working at a C-Town Supermarket for $9 an hour, then worked as a low-wage caregiver. Daluz herself worked nearly 12 hours a day, an exhausting schedule. Recognizing a growing need for better work opportunities, Damayan’s members began seeking new solutions. They found an organization with an innovative strategy that was helping to empower the residents of the low-income Latino and Chinese neighborhood of Sunset Park, Brooklyn. Since 2006, the Center for Family Life, a program of the SCO Family of Services, a social services organization based in Sunset Park, has supported the growth of eight worker-owned cooperatives, including Si Se Puede! Women’s Cooperative, We Can Do It! Inc., and a child-care service called Beyond Care. The initiative started when women in one of the center’s English language classes reflected on their lack of access to the job opportunities provided through the center’s employment program. This inspired the center to research the Oakland-based organization Prospera (formerly WAGES), which has helped Latina women build cooperatives since the mid-1990s. The Center for Family Life and its members grew excited about the opportunities this alternative model could bring to the impoverished immigrant community of Sunset Park. “In contrast to typical hierarchical and profit-driven businesses that really drive the money back to those with access and wealth, co-ops really place both the group of workers and the community at the center,” said Rachel Isreeli, the Center for Family Life’s worker cooperative developer. A traditional business might seek to maximize profits by paying less, requiring workers to use subpar equipment, or using so-called “flexible scheduling” to require shifts only when demand is high. In contrast, cooperative worker-owners are their own bosses, following standards set according to their own priorities. The model was also attractive to Damayan for another reason: Participation in cooperative development could allow worker-owners to cultivate new leadership and social skills. Immigrants could build self-esteem, applying old skills many had been unable to use since arriving in the United States. And cooperatives could provide flexibility to worker-owners, who could speak their own language, control their schedules to accommodate child care, and build business practices according to their own values. For many of the women who brought experience in home care, nannying, or housecleaning, cooperatives also provided a path to less isolating, more empowered domestic work, creating a forum for workers to share information about bad clients. After Damayan’s staff and board members attended one of the center’s trainings, they were eager to start their own cooperative, and hired the center to provide technical assistance and training. Isreeli says Damayan’s members are unique in the cooperative movement—both as Filipinas and as survivors of trafficking. Yet they also have similarities to the center’s other cooperative owners: immigrant women of color at the bottom of the capitalist system, bent on discovering a new form of mutual empowerment. On Tuesday evenings, Daluz, who works 8:30 a.m. to 7:00 p.m. Monday through Friday, runs “like a horse” to get to the cooperative’s meetings. She is often stretched thin, and her youngest son is frustrated by how often she leaves the house for Damayan’s offices. But her excitement at the prospect of becoming her own boss has carried her through this tiring year. “If you’re really interested in the business … you have to manage your time,” she explained. The launch took more than a year of intense labor by staff, board members, and owners. First, Damayan held an open house to educate its community about cooperatives. This wouldn’t just be another job, staff explained. Participants had to be willing to make a long-term investment, absorb new information, and participate in collective decision-making. The group received 20 applications, but the pool quickly narrowed as applicants struggled with the time commitment. Ten members (there are now nine, after one dropped out due to health issues) attended 12 weeks of cooperative training, met every Tuesday night to decide on business policies through a consensus process, received instruction in commercial cleaning and Occupational Health and Safety Administration standards, and contributed $100 each in start-up funds. They also participated in political education workshops covering topics like collectivism and the global economy, and even held a walkathon fundraiser, marching from a Queens Filipino restaurant all the way to Manhattan. The worker-owners meet at Damayan’s headquarters (Standing: Leah Obias, Damayan’s community organizer.) Photo courtesy of Damayan Cleaning Cooperative. Damayan had already helped two individuals get a contract with the Nature Conservancy, cleaning three floors of offices for $15 an hour. So the members decided to focus on an office-cleaning business, advertising services to nonprofits, labor advocacy organizations, churches, and other groups with a social justice consciousness. Since its official launch on September 27, 2015, Damayan Cleaning Cooperative has acquired the contracts for The Nature Conservancy and the Brooklyn Community Foundation, which canceled an existing, cheaper contract in order to support Damayan’s business. “Your mission and your values [should] really reflect how you operate as an organization,” said Brooklyn Community Foundation Executive Director Cecilia Clarke, who sees her partnership with Damayan as an opportunity to bring “opportunities to those with least access”—including the nearly 40 percent of Brooklynites who are foreign-born. The cooperative hopes to gather enough contracts to allow each member to work at least 20–40 hours a week. In the long term, the members hope they can provide employment for other people in the community, including those who were initially interested in the enterprise but couldn’t make the time commitment. Daluz also thinks it might be interesting to expand the cooperative beyond office cleaning. Perhaps most importantly for the individual workers, the Damayan Cleaning Cooperative adopted a wage requirement of $15 an hour, ensuring that all future contracts will give members as decent a livelihood as possible. (As of December 31, the statewide minimum wage will be $9 an hour). Though Daluz currently makes $16 an hour, she hopes she will one day be able to work full time for the cooperative, then take on additional work for “extra money.” Even with a higher wage, caring for four kids in New York City is not cheap. On a Saturday afternoon, dozens of Damayan’s members and their families gather in a church on Manhattan’s West Side for the annual General Assembly, where the membership elects its board of directors. They welcome one another, call the executive director “ina”—mother—and lovingly nag each other to enjoy the feast of rice noodles, pork, and sticky rice desserts. Daluz is often moved by her daughter’s performances: Earlier in the year, Catherine acted out a silent performance conveying the experience of trafficking. This song, too, reminds Daluz of her journey: No more popping painkillers to treat infected fingers and backaches. No more physical abuse and screamed reprimands. No more sneaking at night to the boss’s fridge to steal mouthfuls of rice. Now, she is the boss. “You feel free—you feel this is your business,” Daluz says. She speaks in metaphors and uses her hands to depict a plant that grows, then wilts with death. “This is a plant nearly grown up,” she says. “At the end it’s going to go away.” It’s a symbol, she explains, for the transience of human life, and therefore, the necessity of devoting one’s limited time to others. Abigail Savitch-Lew wrote this article for YES! Magazine. Abigail is a reporter based in Brooklyn. Her work has appeared in City Limits, Dissent Magazine, Jacobin, and The Nation.